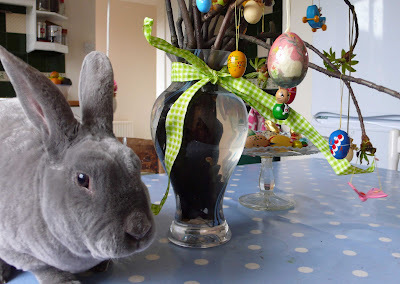 Happy Easter from my favourite Easter bunny, although I'm very biased, Captain Rupert. Captain Rupert and I love easter. You see rabbits everywhere. 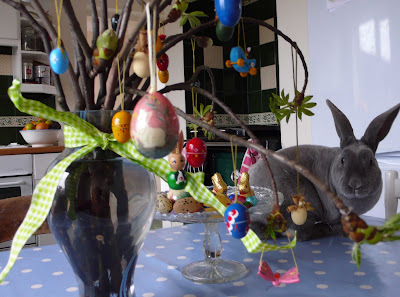 We have put up an Easter Tree this year. I had hoped the leaves would come out a little for easter but it must be far too cold in our house. I think Captain Rupert might think sticks are for chewing and got bored of looking at the Easter tree and a little disgruntled there was not any toast to be had, so sneaked of to his make shift burrow under the spare bed. Where he sat out all the cold rainy weather this afternoon. 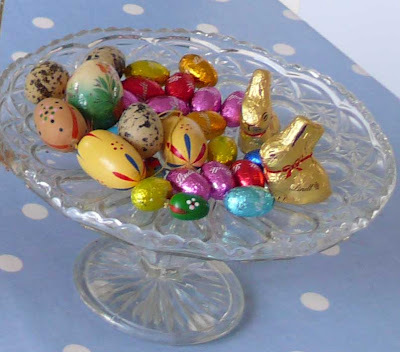 If only the Easter bunny could fix nice weather for Easter. A Piece of cake or a piece of ........... The healthy option is to have a sweet juicy flower, or all the flowers I planted in my pots! 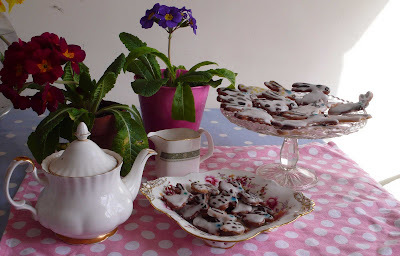 Anyway come on in, and look what Captain Rupert and I have been baking. 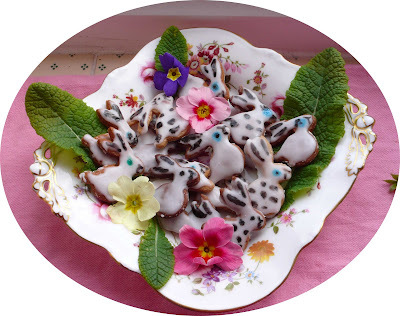 My grandpa was a baker by trade and we have always had these rabbit cutters in the cupboard that must of been his, I have always loved them, but that might be no surprise! 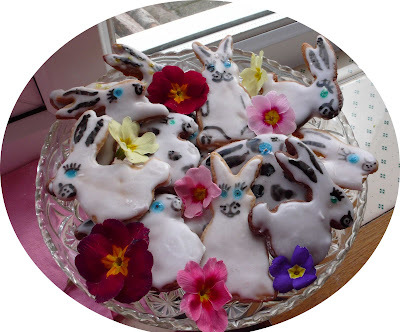 My cookie cutter collection consists mainly of rabbits, and I was a little disappointed when I went to look for a heart shape before valentines day, so I will have to fix that. It was nice to bring out all the rabbits and enjoy the spring air and sun shine. There are small baby rabbits. Here they all are hoping around in some rather tasty flowers. Well that is captain Rupert's opinion as he likes to eat all the ones I plant. What a happy time was had by all. 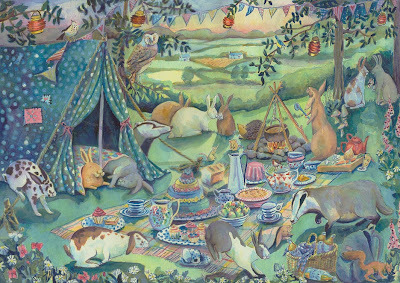 Captain Rupert was joined by a great many of his rabbit friends near and far. They chatted and danced and ate and played games and I might even be able to spot a little love in the air! The badgers organised an excellent game of hide and seek and the squirrels turned up and played there favourite game of kiss chase. The amazingly towering carrot cake went down a treat and so did the carrot stew, being brewed on the camp fire. Captain Rupert thought it was about time to have some more photo's of him on this blog and what better excuse than a garden update. 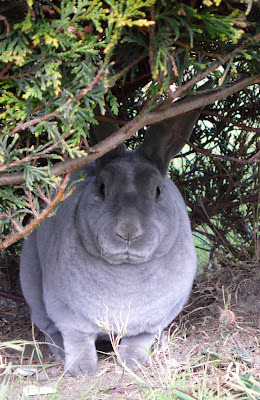 I met him early this morning in one of his favourite hiding places underneath the old hedge. He looked at me very disapproving, as I had been late for our appointment. Rabbits are very good time keepers! On with the update. A major experiment is taking place by K. He has swapped and shared a large order of seed potato's, we have a grand total of twelve different varieties. Earlies, Main crop and late, including red duke of yorks, pink fir, and rocket. They have been laid out in the summer house for chitting. The aim of this experiment is to find a variety that tastes most like the ones his grandad used to go. Captain Rupert and I will keep you informed. 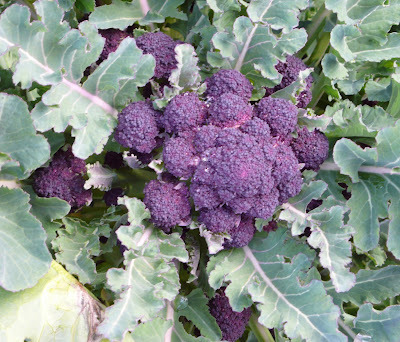 The purple sprouting broccoli is just about ready, we have never grown this before. Its not in the veg patch, but adds interest and colour to the front garden all winter long. Not only does it taste yummy but it holds its own looking pretty amoung the flowers. I would certainly grow it among the flowers again and the same for the curly kale. 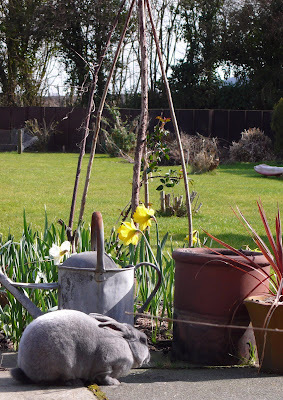 The Daffodils are late in our garden, I think its due to it being such a windy place. Captain Rupert is rather pleased with the extra bulbs we planted, he takes great care of them, chinning them at any possible moment. As if to say his so proud of them and grow into lovely plants. Its lucky for me as they seem one thing he does not like the taste of. Back in the raised beds the spinach and spring onions and broad beans are doing well. 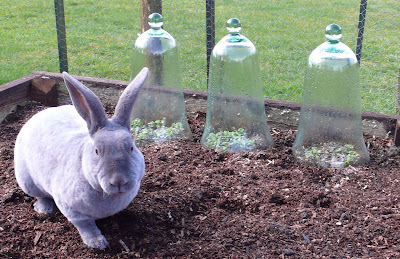 Under the cloche is lambs leaf, I must sow some more lettuce seeds. There seems to be something very nice about going out into the garden to pick leaves for lunch. We have Land Cress growing as well. It has a strong peppery flavour like watercress, but grows like a weed in the winter. I sometimes add some young spinach leaves into the mix too, it makes for a wonderful tasty mix of leaves. New leaves we are trying out under our glass cloche are an Oriental leaf mix . Captain Rupert has been inspecting how well they are growing, his pleased with their progress and we are looking forward to some yummy salads. 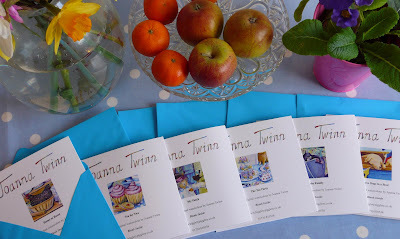 Its still chilly out of the sun in the garden, so back into the house to warm up with a cup of tea and a slice of warm slice of toast for Captain Rupert at the kitchen table and look whats there. 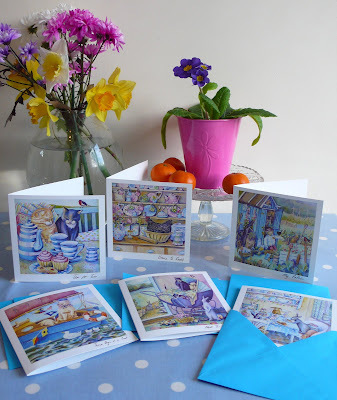 All the new card designs back from the printers, including Captain Ruperts 'Tea Party'. 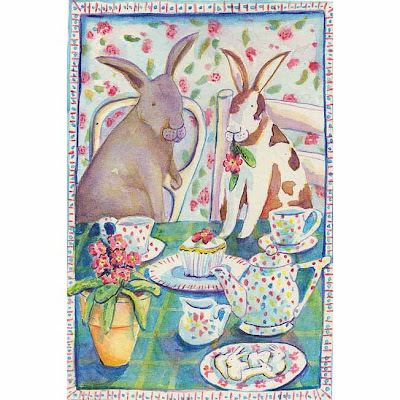 He is rather proud the tea party made it onto a card and says he thinks I should pay him royalties so he can buy the very best rabbit food and bread for toast, maybe even raisin bread. They are now available here. PS. sorry the link was not working I think I have fixed it.